Did you know that beer is by far the most popular alcoholic beverage in Japan? More so than traditional tipples like shochu, umeshu and even sake. Indeed, the Japanese consume even more beer than the lager loving Brits! You may already be acquainted with some of the larger names in the world of Japanese beer, known as biiru in Japanese. Asahi and Sapporo are the big boys of course, and we’ve looked at some delicious examples previously in our previous Top 5 Japanese Beer Taste Test. But did you know that our Japanese beer range extends beyond the realms of mainstream Japanese lager? In Japan, the majority of beers are of the light, easy drinkable variety which suits the izakaya culture perfectly. However, curiosity for alternative beers is growing steadily, including dark and craft beers. Bear in mind that even dark beers are served chilled in Japan (as is red wine for that matter!) which may displease your average anorak clad dark beer enthusiast, but we actually find rather refreshing. So pop off that bottle cap, crack open that can and come on a refreshing journey with the beer lovers at Japan Centre. First up is the gentlemanly Musashino Premium brew from Nagano based brewers Kurohime. The sophisticated bottle and elegant label speak volumes about the beer inside. This amber coloured liquid has a woody, hoppy aroma that conjures up the image of an ancient forest. Its earthy flavour matches its natural feel, accompanied by a lively fizzing. Light bodied and slightly sweet with a crisp finish, we think this amber nectar accompanies a spicy ramen perfectly. Musashino Premium Brew can be found at Japan Centre Piccadilly and online. Kagua describes itself as ‘Japanese Scented Ale’. This wonderful craft beer is chic, stylish and absolutely unique. It lives up to the tag line, giving off a fruity, floral aroma that’s more fitting of a perfume than a beer. “Why is this ale so FRAGRANT?” we hear you trumpet. Kagua uses distinctly Japanese ingredients like yuzu and sansho in the brewing process, which is reflected in the citrus flavour. That’s not to say this is a frivolous fruity alcopop of a beer; Kagua Blanc is a full bodied beverage with mellow vibes, and at 8% proof its not for the fainthearted. We believe this Blanc version is the ideal accompaniment to the lightness and delicacy of sushi. Kagua Blanc can be found at Japan Centre Piccadilly and online. The darker cousin of the Blanc, Kagua Rouge is stronger in both flavour and strength. With a ruby visage and a thick, foamy head that lingers a while, it certainly is appealing to look at. The fragrant, citrus flavour is accentuated even more in this beverage, contrasting deftly with the natural tones of the Musashino. The finish too lasts a little longer, leaving a flowery taste that dances on your tongue after drinking. Considering it’s punchy flavour and strong proof (9%!) we deem Kagua Rouge to be a sipping beer, one that accompanies yakiniku wondrously. It may not be for everyone, but this characterful craft beer certainly had us charmed. Kagua Rouge can be found at Japan Centre Piccadilly and online. This stout from Tokyo based brewers Kirin is beautifully dark and when poured into a glass, is complimented by an appealing caramel halo, rather resembling Guinness. However, it’s nowhere near as heavy and dense as the Irish bevvy. Its aroma is fairly mild, with the slightest hints of coffee- very distinct from the maltier lager alternatives on this list. Its flavour is earthy yet light, a slight surprise considering its coal black appearance. We think Kirin Stout is an ingenious concoction; a drinkable, bubbly stout that’s incredibly refreshing and perfect served chilled, with the distinct flavour of a dark beer. We’d recommend drinking it with a winter warming dish like this Korean Style Kimchi Hot Pot. Kirin Stout can be found at Japan Centre stores and online. Brewed in the snowy city of Sapporo by the company of the same name, Premium Yebisu is one of Japan’s most popular beers. This lager is golden in colour, with a malty aroma that’s evocative of the relatively strong flavour as compared with other mainstream Japanese lagers. Premium Yebisu’s rich taste is complimented by a satisfying amount of fizz on the tongue and a clean finish. It’s a highly drinkable lager with a alcohol proof of 5%. All in all, we definitely recommend Premium Yebisu. Its satisfying malty flavour accompanies classic izakaya grub like karaage and edamame perfectly. Premium Yebisu can be found at Japan Centre stores and online. 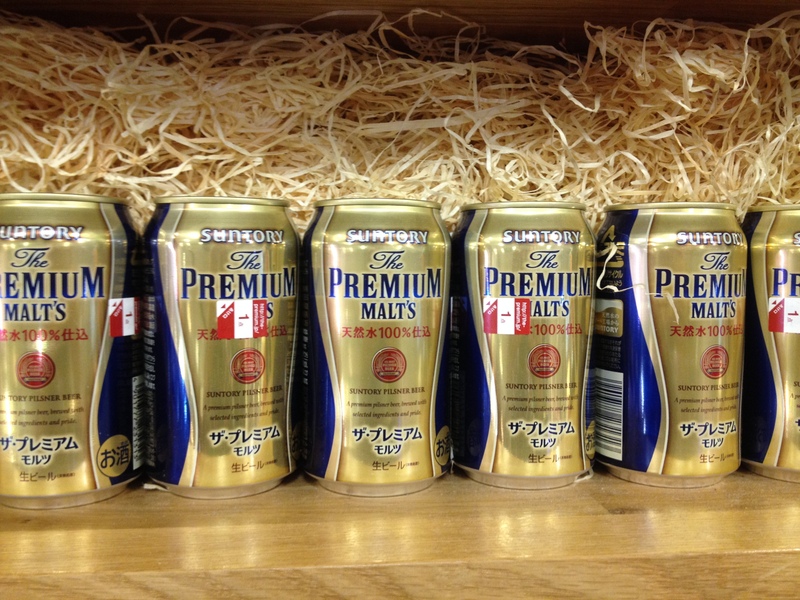 The final premium beer on our list is from Japanese beverage giant Suntory, based in Osaka. Whilst perhaps the least appealingly packaged beer on our list and with a hue less golden than the Premium Yebisu, Suntory Premium Malts should not be disregarded. In fact, its pale colouring is down to the fact Suntory Premium is a pilsner style beer. Its aroma is malty with floral hints suggesting a sweet lager, but on tasting the beer we were surprised to find it slightly bitter. It’s a smooth lager that, like the Yebisu, has a punchier, maltier flavour than other Japanese lagers. We think this is a decent, cheerful lager that might not be too fancy, but does a cracking job of accompanying some hearty Osakan favourites, such as takoyaki and okonomiyaki. Suntory Premium can be found at Japan Centre stores and online. Final verdict: After a thorough taste test and a new-found and worryingly deep emotional connection to Japanese craft beer, we have to elect Kagua Blanc as our favourite for its unique flavour and full body. If you want an easy drinking tasty lager, we’d crack open a can of Yebisu Premium. However, all these beers have their perks and we’d encourage you to get on down to Japan Centre, pick up some biiru and conduct your own taste test! Posted in Uncategorized and tagged japan, Japanese beer, Premium Japanese beer, Premium Yebisu, taste test. Bookmark the permalink.